Applications for the FINAL FANTASY XIV Open Beta Test have been temporarily suspended. Please wait until we are ready to accept new applications and then try again. Yup. Definitely Open Beta time in Squeenix land. Well, apparently I just had to comment in a few places crying about it, cus I just got through. What, so the applications aren’t temporarily suspended? Don’t worry, heh, I can’t even get it to work. Increase your capabilities for playing the game AND making and accessing accounts…. The only things laggier than the game itself (judging by the performance this evening) are the updater and the mouse cursor. Pretty, yes. Beta, even more so. Hah, no surprise there. Open betas are really just glorified stress tests these days. Grats on actually getting in! 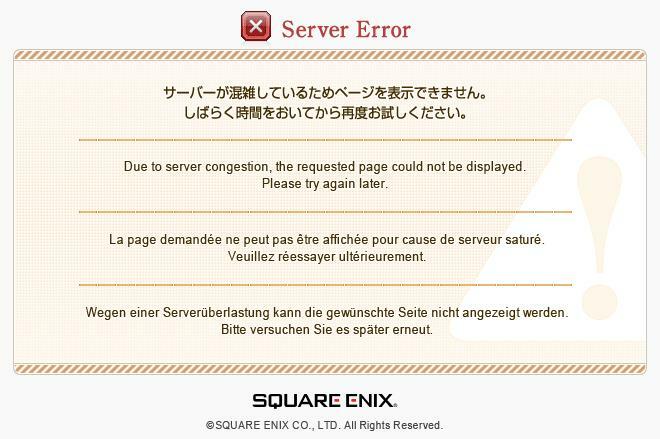 yay congratulations Enix on f***** up once again… since 7PDT(10PM EST) i have been refreshing and reloging in to my account… it took me 8 hours to even get to the log in to apply for beta. and of course by that time they were suspended lol. well i hate enix with passion more than anything in the world. but because i really love FF series…. i will just go get some serious sleep and play the game when i get my preeorder copy. and if an SE representative reads this. i Hope you bankrupt you pos useless company who does not know how to communicate with the people that keep their games running. Why would you want a company that you plan on purchasing a game from to go bankrupt? Why would you purchase the game from a company you apparently loathe so fully? At some point you’re going to have to realize that FF aint what it used to be, and move on to greener pastures. *grumble* I don’t have the will to sit around and click like a trained monkey in my old age. Tried fairly consistently for several hours to no avail. Naturally, I got the same message you did this morning. This game isn’t really on my radar right now. Planning an eventual PS3 purchase so i can play it from my couch if it gets good reviews.